US Secretary of State Condoleezza Rice has announced the creation of a new post to help "accelerate the demise" of the Castro regime in Cuba. 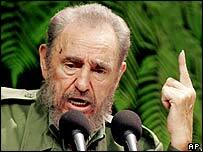 Ms Rice said for 50 years Fidel Castro had condemned Cubans to a "tragic fate of repression and poverty". The post was recommended in a 2004 report on Cuba by a commission headed by Ms Rice's predecessor Colin Powell. The report outlines the steps the US is prepared to take to bring about regime change in Cuba, such as subverting Mr Castro's plans to hand over power to his younger brother. Introducing Mr McCarry at the State Department in Washington, Ms Rice said the US was working with advocates of democratic change on the island. "We are working to deny resources to the Castro regime to break its blockade on information and to broadcast the truth about its deplorable treatment of the Cuban people," she said. She said the aim of the effort was to "accelerate the demise of Castro's tyranny" on the Caribbean island, which he has ruled since 1959. Earlier this week, in a speech marking the anniversary of the Cuban revolution, Mr Castro accused the US of financing dissidents and false propaganda. "No other revolutionary process has been able to count on as much consensus and overwhelming support as the Cuban revolution has," he told supporters in Havana.